The Adobe Type Collection is a large collection of full fonts managed on a font server. 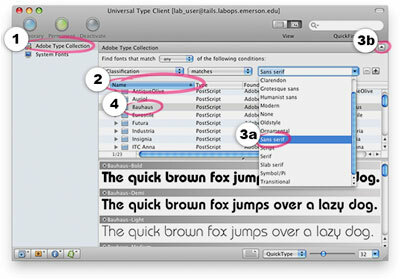 These fonts can be accessed for use on any computer lab Mac using the Extensis Universal Type Client (UTC). This guide is also available as a printable PDF. Start up Universal Type Client. A window will prompt you to connect to the server. The Server field should say fonts, and Port should be set to 8080. Enter lab_user for the Username and leave the Password field blank. Click Connect. Once connected, click Adobe Type Collection to view a list of available fonts. Fonts are grouped by family and sorted by Name. Click on the column header of another attribute (such as Class) to sort by that trait instead. The list can be narrowed by attribute by selecting Edit > Find Fonts... and choosing criteria from the drop-down menus. Click on the arrow at the upper right to return to the complete font list. Click on a font to preview it below. 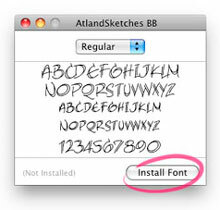 To activate a font, select it in the list and click the blue Temporary button. This will keep the font active for use in applications until you log out of the workstation. When a font is activated, a blue dot will appear next to its name in the UTC font list. To deactivate a font, click on the blue dot next to the font’s name. The dot will disappear, indicating the font has successfully deactivated. You may sometimes need to use a font that is neither available in the Adobe Type Collection, nor pre-installed on lab computers. In this case, you can temporarily install the font on a workstation. Quit any open applications that will need to use the font. Download or copy the font file to the computer. Double-click on the font to open it with Font Book. Please note: The font will only remain installed on the workstation for the remainder of the day. It is important that you hold on to your original copy of the font to use later or on other workstations.